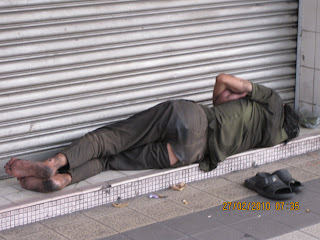 Pictures show homeless men sleeping in shop doorways along Pudu Road, Kuala Lumpur. This pavement is apparently the favourite sleeping space of these two homeless men. 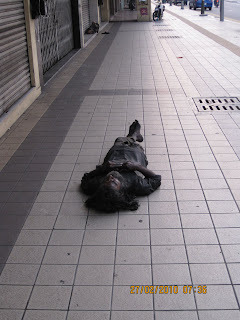 Government claims that there are no homeless people in Malaysia are belied by these images. Homelessness exists on Malaysian streets. Homeless people can also be found in Penang, Ipoh and Johor Baru, among other states. How do we help them especially young homeless people who become ensnared in a life of crime? The more important question is: do we want to help them? Some people are homeless because they have no choice. But they are prepared to help themselves, like the guy in The Pursuit of Happyness. But some who are homeless because they have no choice are unable or unwilling to help themselves. But they do not mind getting help. Temples, mosques and churches can look out for such people to extend a helping hand. Then there are others who are homeless by choice. They would rather have the freedom of not having to pay for a home and then having to look after it. They are happy like stray animals to stay the night wherever they please. Such people who choose to be homeless should just be left to fend for themselves. That is an interesting perspective. Thank you very much. Hello, I'm Tasha, a member of Reach Org, you can join us in the feeding program to help the poor. for your information, there is a shelter for this homeless. Anjung Singgah. i hope that this centre effectively help these person to live normally.